How many times have you gone out to lunch or ordered catering and left with a feeling that you just helped someone else out? No, I am not talking about the server wearing orange short shorts who you tipped 30% for serving you beer wings because she was a struggling student. I am talking about helping families in need out. 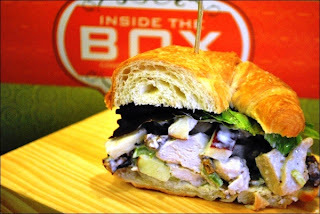 I had an opportunity to eat at Inside the Box in Downtown Tampa. Inside the Box Cafe & Catering is the brainchild of Metropolitan Ministries. I was introduced to MM a few months ago while doing a Day of Giving Back with my company, North Highland. Today, I was fortunate enough to have an opportunity to sit with their President and CEO Tim Marks, along with Advancement Coordinator Keelee Wren to learn a little more about what Inside the Box has to offer. One thing that immediately impressed me was Inside the Box's concept. Imagine Tom's shoes - One for One (for every pair purchased, a child in need receives a pair) but incorporate that with food: A meal for you a meal for them. For every meal purchased at Inside the Box, you are giving someone in need a meal. 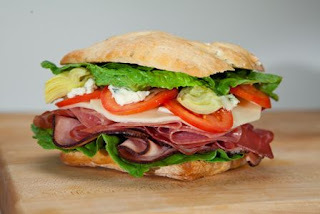 It is in a great spot to grab an inexpensive gourmet sandwich or salad in Downtown Tampa. A 1/2 sandwich will only set you back $3.95! Inside the Box Executive Chef, Cliff Barsi spent three decades working in resorts and corporate catering. 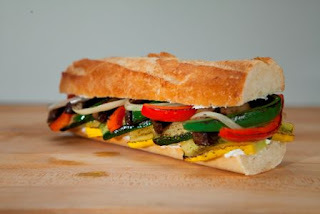 Now he is uses his culinary skills to train those who want to better their life. All of the staff at Inside the Box are graduates of Metropolitan Ministries program, helping people get back on their feet. This concept not only keeps people off the streets but gives them hope and a future. Today, I tried the weekly special (which I feel should be on the menu all the time), the Chicken Waldorf Sandwich. It was full of flavor and fruit.